You are here: Home / 2011 Grey Cup / Interview: Dante Marsh: The 2011 season, the future and a helping hand for cancer. Interview: Dante Marsh: The 2011 season, the future and a helping hand for cancer. 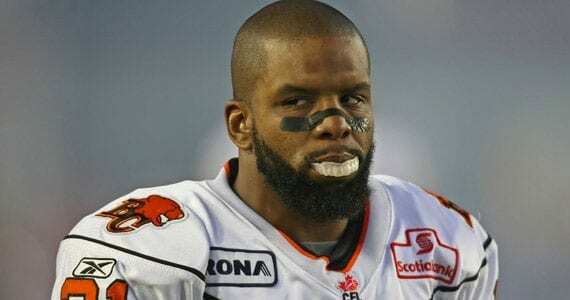 The BC Lions recent Grey Cup win was the sixth in franchise history and veteran Dante Marsh has been patrolling the corner for two of those titles. Marsh has just completed his eighth season with the team and will hopefully be joining them for a ninth. We had a chance to talk to Dante about the 2011 season, the future and about an auction he is holding to make a donation to CFL Fans Fight Cancer and Hannah’s Heroes. Dante is auctioning off two pairs of his cleats from the 2011 Grey Cup championship season. One pair are pink Nike Vapor cleats that Dante wore on October 22, 2011, when the CFL allowed players to wear pink items in support of women’s cancer awareness. The second pair of cleats were worn in the 99th Grey Cup Championship game in which the BC Lions defeated the Winnipeg Blue Bombers by a score of 34-23. We’ll get you the link to the auction below, but first our interview with the BC Lions veteran cornerback, Dante Marsh. BCLD: Dante, it was a season that will never be forgotten. The team started slowly before turning things around to end the season with a Grey Cup victory at home. What was that like and what do you feel was the one thing that turned the season around? DM: It was amazing to say the least. I mean it still hasn’t really hit that we won the 99th Grey Cup. Starting out 0-5 after a sluggish 1-7 start in 2010 was extremely frustrating. We felt like we were the team to beat coming out of training camp especially the way we ended the 2010 season. However that did not happen and once again we sputtered out of the gate. I think our attitude was the one thing that changed which enabled us to get over the hump. We were just tired of losing. BCLD: Personally you had one of your best years in the league, as your stats show. You were named a West Division all-star, you won your second championship and now you’re eligible to become a free agent. What does the future hold for Dante Marsh and do you want to end your career in black and orange? DM: I would like a couple more rings. I feel like I have done my part as far as my job goes. I feel like I have had a very good career so far and I would like to finish up where I started and thats in black and orange. This has been maybe my best all around season but like I have said before I think I have had really good seasons other years and they were over looked to an extent. I am scheduled to become a free agent this winter for the first time ever which is exciting but yet gives you an unsure feeling. Exciting to see what your value is to others but at the same time I bleed orange and black and hopefully I can retire as one of the best to ever do it at my position in a Lions uniform. BCLD: You played eight seasons under Wally Buono as a coach and now your defensive coordinator Mike Benevides is widely speculated to be Buono’s replacement. How might the team be different under a Benevides coached team if he were to get the job? DM: I am not sure things will change all that much. Benny has been one of the coaches I have had a real good relationship with since my rookie year when he was the special teams coordinator. In fact I think you can keep the same structure and continuity within the team if he is ultimately hired. Benny is a players coach easy to talk to and is open to suggestions so I think everything will just keep flowing smoothly. BCLD: Your off-season training is well publicized and you train with CFL legend Milt Stegall. How has the old “G.O.A.T.” as you refer to him helped you train for a long and successful career in the CFL? Can you tell us what G.O.A.T. stands for? BCLD: Dante, let’s get you your charity auction. This is the second year now that you’ve done a charity event for Cancer research. You’ve graciously offered to give half of the proceeds for this auction to our cancer charity of choice, Hannah’s Heroes’. I know that the tragedy that your good friend Korey Banks went through is close to your heart. Can you tell us how that event has made cancer research important to you? DM: It’s an opportunity for me to give so someone else can have. I feel like if you’re in a position to help someone other than yourself and you dont you are truly missing out on one of life’s greatest moments/feelings. I have always wanted to make an impact on someone elses life. There are people who cant walk, cant see, can’t have the normal life because of cancer or some other ailment and these are little things we often take for granted on a daily basis. When Korey went through that ordeal with his son Kamari, it hit close to home and I wouldn’t want anybody to ever have to go through that. So yeah I just feel its one of my duties to help in any way I can. BCLD: Dante thank you for taking the time to do this for Hannah’s Heroes and for talking with us. We wish you all the best in the future, and hope you’ll be back in BC to defend the Grey Cup championship in 2012. DM: As always I appreciate you Brian and thank you for taking the time to put this Q and A session together. CHUUCH!!! For the current auction of Dante’s cleats you can head to the Ebay page they are listed on. If the auction ends without the reserve being met, get the latest on Dante’s website. These cleats are one of a kind collectors items and would be a great addition to any CFL memorabilia collection. You’ll also be helping fund cancer research for childhood cancer. For more information on Hannah’s Heroes visit their web site.